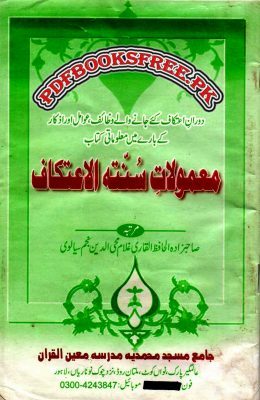 Mamoolat e Sunnat ul Itikaf book written by Hafiz Ghulam Mohiuddin Najam Sialvi. Most important book ever written about Itikaf. This book described Islamic Wazaif and Supplications of Itikaf according to the Sunnah of our beloved Prophet Muhammad Sallallahu Alayhi Wasalam. Learn in Urdu language. Must read book before stating Itikaf in last Ashara of Ramadan. This book is available here in Pdf format. Click on the following links to read online and download the complete book in Pdf format to read offline.